Wisconsin Historical Markers: They're Out There . . . The following article appears in the April-May 2014 edition of Northeast Wisconsin Lifestyles. They’re out there. Mostly in plain sight, sometimes obscured by overgrowth, sometimes in places so remote even locals no longer notice them. Still, they’re out there in the hundreds. Rigorously researched. Meticulously made. Purposely placed. All intended to ignite the imagination of future generations – who would be us! 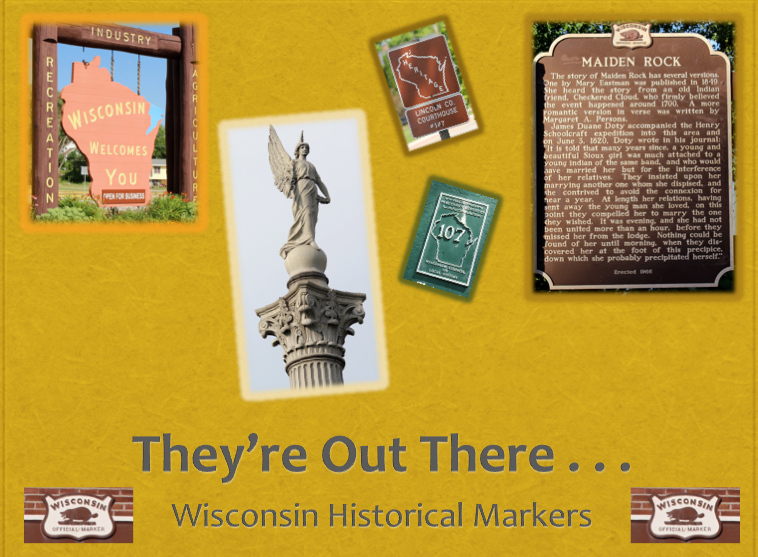 Bronze tablets bolted to boulders, massive wooden markers mounted between hewn logs, metal signs a top slender silver poles – the history of Wisconsin is preserved by a variety of shapes and sizes of historical markers. Easily accessible at roadway turnouts and rest stops, inside parks and recreation areas, on or near government or other important community buildings, passersby may not notice them at first -- but once aware, markers turn up everywhere! 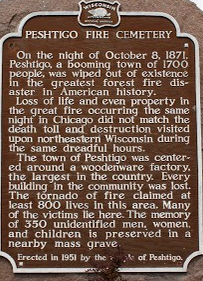 Whether erected by state, county, or local societies, individuals or groups, Wisconsin’s historical markers serve three purposes: they identify a location where some significant event occurred; they commemorate that event; and they bring that event to the attention of people of varying ages and backgrounds in a way that is interesting, understandable, and meaningful. For a comprehensive online survey of Wisconsin historical markers, Civil War and veterans memorials, visit wisconsinhistoricalmarkers.blogspot.com. 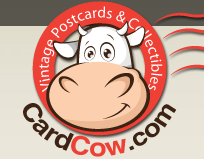 The website includes nearly 2,100 posts and approximately 15,000 photographs. 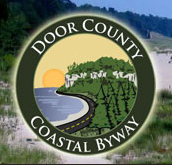 This article will focus on a limited few of the historical markers of northeastern Wisconsin. Some of Wisconsin’s first historical markers are found at the nearly 100 Civil War memorials throughout the state. 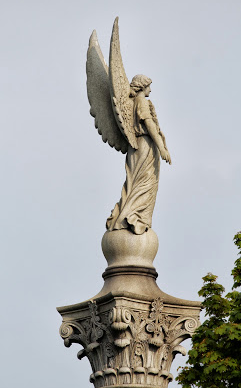 The first memorial was dedicated July 4, 1867, in Lancaster (Grant County). In northeastern Wisconsin, civil war memorials consisting of a Union soldier positioned on ornate columns standing as high as 46 feet, can be found in Calumet, Kewaunee, Marinette, Sheboygan, Fond du Lac, Ripon, Two Rivers, Oshkosh, Kaukauna, Hancock, and Manitowoc. Chief Wampum died in December 1844, and was buried in a rough pine box by some 500 mourners who braved a fierce snowstorm for a funeral held with “all due ceremonies accompanied by all the doleful songs and lamentations incidental to a pow wow” and which afterwards was “kept up daily for fully three weeks”. The Chief was over 6’ feet tall, known for his “dignified and courteous” demeanor and his honesty in dealing with both whites and his own people. He was often sought out to resolve disputes, his decisions bearing as much weight as any court judge. Over the years, the burial site became lost. In 1908, the Manitowoc County Historical Society desired to erect a tablet honoring the venerable Chief. They solicited the services of one George LaCount, who had attended the Chief’s funeral as a boy and knew well the burial site located on a farm formerly owned by his father. After a 46-year absence, George returned to Manitowoc Rapids to mark the exact spot where the Chief lay at rest. The marker was prepared, and on August 9, 1909, “fully 4000 people”, the largest crowd in Manitowoc Rapids’ history, gathered at the monument dedication. Much of the magic of the Christmas tree we know and enjoy today is due to the efforts of the loggers and schooner captains of Wisconsin who delivered fresh cut pines to Milwaukee and Chicago in the 1880s. 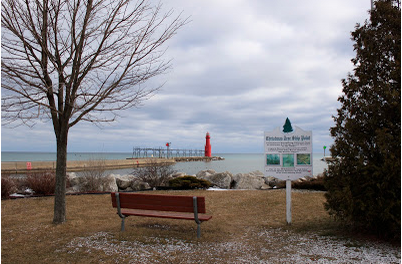 At its Algoma location, with a breath-taking view of Lake Michigan and the Algoma Pierhead Lighthouse, the “Christmas Tree Ship Point” marker commemorates the fascinating, endearing and ultimately tragic story of the Christmas Tree Ship. 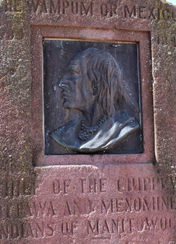 Chief Waupaca was a friendly Potawatomi Indian living in the vicinity of what is now Waupaca, when the first white men arrived. Even though his tribesmen bitterly despised the white settlers, Chief Waupaca remained on friendly terms with them. When the tribe conspired to massacre an entire small white settlement, Chief Waupaca convened a gathering of his people and persuaded them to leave the settlers in peace. He then remounted his pony with the intent to leave, but suddenly fell dead and toppled to the ground. A State historical marker is located in Marion at nearly the exact spot where the Chief fell and was hastily buried. Of all the breeds of dog recognized by the American Kennel Club, only five were developed in the United States and one, the American Water Spaniel, originated in Wisconsin. A marker in New London honors the early 19th century “Birthplace of the American Water Spaniel”, a medium-size dog sufficiently compact to travel in a small rowboat while hearty enough to withstand the frigid temperatures of Wisconsin waters. The breed was made the state dog in 1985. 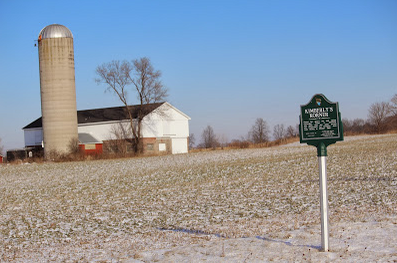 Near Almond, on County Highway J, just south of its intersection with Akron Road, in the middle of miles of farmlands, is erected a marker honoring Wisconsin’s own knighted son. Born on a hardscrabble farm in 1853, young Henry Soloman Wellcome grew up to be a key figure in the development of pharmaceutics and the promotion of medical research. Researchers at his laboratories in England “helped discover new treatments for diseases such diphtheria, yellow fever, malaria, leprosy, and sleeping sickness.” Eventually becoming a naturalized British citizen, Sir Henry was knighted in 1932. The idea of a "Republican" party was conceived in 1852 by Alvan Earle Bovay, of Ripon, and Horace Greeley, in New York, with the intention to dissolve the Whig Party in favor of a new party that could "fuse together anti-slavery elements.” Visit the “Little White Schoolhouse” in Ripon to see a state historical marker, a local historical marker, and a 1974 plaque identifying the location as a National Historic Landmark. In 1950, 1951 and 1952, open-road, sports car racing was hosted by the Village of Elkhart Lake on the roads surrounding it. Historic Race Circuits of Elkhart Lake, along with numerous donors and sponsors, erected 15 historical markers around the race circuits, commemorating names and events associated with the racing. The markers are easy to find, and bear whimsical names like Wacker’s Wend, Hamill’s Hollow, Schoolhouse Straight, and Dickens’ Ditch; the route is listed on the National Register of Historic Places. Wisconsin’s history starts in the northeastern counties, where majestic white pines once kissed the stars, wildlife abounded, and native peoples built effigy mounds to bury their dead. Be watchful. Be attentive. Be curious. They are out there – those marvelous snippets of history and the opportunity to imagine when there wasn’t always a Quik Trip on every other corner.